All horses love Halloween, even the horses at the Free Rein barn. They decided to take a week off from giving rides and are going to celebrate Halloween tomorrow in the way all horses do; extra hay! I actually had a week off before this. Our family flew to Tampa Bay, Florida, and enjoyed a week at the beach on Captiva Island with our friends, the McLendons. We had a fabulous time, the weather was fantastic, and the company was great. I am looking forward to seeing Chester next week! Strides Magazine is published by the Professional Association of Therapeutic Horsemanship organization. In the Summer 2015 issue, which recently came out, they included a review of my book. 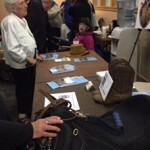 The Free Rein auction was last Friday night. What a fun time!! I had a table set up where I sold my books. 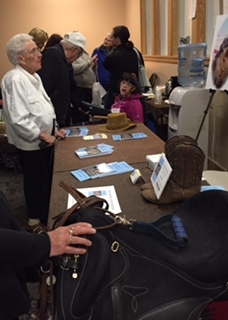 I had a great time visiting with friends and trying to buy something in the silent auction. Alas, we came home with nothing. The Free Rein auction is almost here! Friday night is the big event, and I am excited about helping out. Mom and I will be there Friday morning with a big group of volunteers helping to set up. 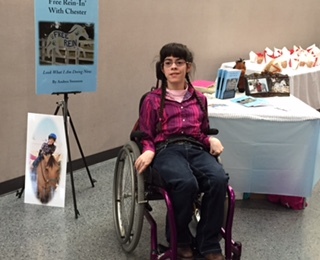 I am very excited because I am going to have a table in the silent auction area and will be selling my book! My friend Anne is going to be my date that night. She had been a caregiver for me for about a year, and is now in nursing school so has no extra time for working. We have a lot to catch up on! I am so excited to share my news with everyone. I have been accepted as a speaker at the PATH International Conference (Region 9) which is being held in Bozeman, Montana, May 29 – 31st. 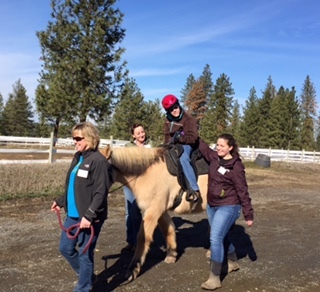 PATH stands for Professional Association of Therapeutic Horsemanship which is the organization governing riding facilities like Free Rein. Region 9 includes Alaska, Idaho, Montana, Oregon, Washington, Alberta and British Columbia. Jeanne and Katie from ENSO (the agency who has been working with me in getting a job and promoting my book) are going to be going to the conference also. Now I have to work on what I am going to say. I will read my book, maybe have some pictures to share, do a short speech and have a question and answer time. This is so cool! What a beautiful day it was for our first time back in the saddle since December. It was a little cool with a breeze, but the sun was wonderful. My riding buddies, Grace and Nathaniel, were back; with Nathaniel sporting a new helmet and Grace wearing new riding britches. My good friend Donna was back to show Chester and I the way; and I have new sidewalkers. Free Rein has been very excited to train over 70 new sidewalkers for this upcoming session. Spokane Teachers Credit Union (STCU) over the last two weeks was running a contest ‘Who Do You Love’. A person could nominate their favorite charity to receive a donation from STCU. In the first week, the top ten charities were picked and Free Rein was in the running. Yesterday the top three were announced; with Free Rein coming in second. They will receive a donation of $1,500. 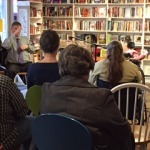 Saturday afternoon was my book reading at The Book Parlor. I had a great time and there was a lot of my friends, their friends, and Grandpa and Grandma Weber that came. My sign language teacher and her husband, Debbie and Russ, also came. 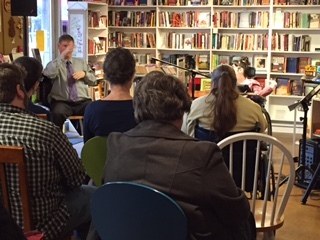 They brought a friend of theirs who uses sign language; and Russ interpreted while I read my book. That was really cool! After the book reading, we celebrated with Grandpa and Grandma Weber at Red Lobster with delicious fettuccine. 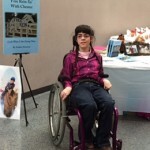 Free Rein is gearing up for their 2015 Barn Dance fund raiser. This year it is going to be at Spokane Community College on Friday March 20th in the evening. They are busy getting donations for the silent and oral auctions. If anyone has any ideas for auction items, just let us know. Mom and I are on the planning committee and will be working with my riding partner, Grace and her mom Lynn, on drinks.